USE SHOP LOTTERY TO SEE WHICH TOWN'S SHOPS ARE BEING DISTRIBUTED. INFORMATION BELOW IS NOT UP-TO-DATE. Originally titled as "Trade Shops," player run shops were introduced during HSN 2004. The landing shopping districts opened 7/25/2004 and each town was quickly added thereafter. In the late 2000s the shop system broke and despite the efforts of several GMs, no one was able to fix it to its intended level of functionality or expand upon the mechanics. In Prime, shops did not get repossessed, rent was not collected, and character owners were not required to visit their shops on a regular basis. Thus, shops were only available by purchasing one from another player. In May 2017, GM Retser completed work on the system, and shops will return into normal circulation this summer. Both of these websites are updated by players using a lich script called update-playershops. While they are not necessarily updated frequently, they provide good search options with details about the wares. Note: Citizendata was the previous data collection script used for many years. As of 7/16/14 it has been replaced with update-playershops. As of January 2015, please update your update-playershops script to make sure it is uploaded to the correct place (Tillmen changed providers). Full or partial citizenship in the town is required. A Premium subscription is required to maintain a three room shop, a basic subscriber may have a one room shop. A subscribed account may only own one shop. Accounts owning multiple shops before this change have been grandfathered in. The shop permit release system is under discussion, TBD by the end of June, shops can still be dealt through the player market. To transfer a shop, the buyer and seller need to visit the shop together and the seller should offer partnership in the shop. Once the partnership is established, the shop ownership can be transferred to the new owner. Any customized room name (e.g. [Dan's Den of Deed Fodder]) will be lost upon transfer, but other customizations, such as furniture and exterior look, will be maintained. Once a shop is transferred, the owner can go to the local shop furniture merchant to choose furniture and decor, including a sign, door, roof and interior items. Interior items consist of display cases, tables, and other furniture decor for each room of the shop. When purchasing furniture, indicate which room of your shop it should go. The Shop Furniture merchant will indicate what piece it replaces. While inventory containers, signs, and decorative items can be purchased anywhere, large building materials such as facades, roofs, walls, floors, and ceilings can only be bought locally, due to the difficulty of transport. The following information applies to the original system. Since shops are not currently repossessed, no deeds come up for sale. Shops are only available on the secondary market. A shop deed (one room for standard, up to three rooms for premium) must be purchased from the NPC at the local permit office, found in the permanent structure that sells shop decor within the player shop area of each town. A one-room deed costs 100k, a two-room deed costs 150k, and a three-room deed costs 200k. Deeds can only be purchased when there is an available space in the shop area, but the shopkeeper does not limit his selling of deeds to the number of open spaces. Someone else may use their deed to claim that slot before you use your new deed, leaving you without a shop. An available slot must be claimed by standing in the room you want your shop in, holding your shop deed or shop permit in your right hand, and using SHOP CLAIM. As you hold up your permit, a shifty-looking human notices. He gives a shrill whistle, alerting several of his seedier-looking friends to come help him erect your new shop. Two of the group are wearing eyepatches, one wears a brass dancing turtle medallion, and one almost looks to have some krolvin in her heritage, judging by the cast of her features, but they do work swiftly and, in a surprisingly short amount of time, the shop is up and the group has vanished toward the bank with your permit to claim the construction fee. A 3% sales tax is automatically deducted from your sale price on each purchase. No more than 1,000,000 silvers in tax will be deducted from any one item. Shop inventories are limited by two factors: counter space and room size. Each room is able to hold up to 25 different items (each item can be a stack of identical items up to 50, loresinging to an item before posting will negate this). Each container is unique and holds a different amount. The Shop furniture merchant will provide information on the containers. A shop owner can set up multiple containers such that the total meets or exceeds the 25 item per room limit. A shop may have up to three rooms, though this is limited to one on a non-premium account. A three-room shop can have a maximum of 75 items for sale at a time. Inventory in shops is available while in the shop via the SHOP INVENTORY command, while outside of a shop via a shop manifest (available from the shopping district warehouse for 50,000 silvers), or via Lich Playershops (though not in real-time). A shop can have up to 4 partners. Each partner can sell items in the shop and access their own profits. The shop owner does not have any access to the partners' profits, nor does the partners' balance count toward rent. The shop owner has the ability to disband the partnership at any time. If this happens, the partners' items will be available in closed boxes at the Shop Permit Authority for pick-up, including any profits due. As of November 2017, a shop partner can use SHOP DEPOSIT to deposit silvers into the main (owner's) shop account to help pay for rent. This is a one way transaction and, thus, partners cannot withdraw from the main shop account. Up to 15 people can be banned from a shop. Shops can offer a discount towards particular races or professions. Race always takes precedence if its value is not 100%. Shops maintain their own bank accounts, from which rent is collected monthly. Rent must come from the shop owner's balance at the cost of 10,000 silvers per room, and must be available on the 1st of every month. Each partner in a shop maintains separate books, and rent is only drawn from the primary shop owner's account. Failure to pay the shop maintenance for 90 days will result in repossession of the shop. Each shop must be visited regularly by the shop owner. Visitation by shop partners does not count toward upkeep of the shop. Failure to visit for 90 days will result in the loss of your shop. This upkeep requires the shop owner to pass through the portal (the door) either alone or as the leader of a group. Inside the shop, the shop owner must use one of the SHOP verb options to check on its status. In the event that a shop is reclaimed by the Shop Permit Authority, the inventory will be held by the permit clerk (in a box identified by name on the floor of the Shop Permit Authority office) for a maximum of 90 days, after which it will be permanently lost. A note for the shop balance will also be in the box. SHOP POLICY contains IMPORTANT information you really should know. SHOP CLAIM will set up a shop in the room you're in. SHOP EXTEND allows you to add rooms to your shop or rearrange their connections. You must be standing in your shop's main room to do this. If you have a permit for extending your shop, use SHOP EXTEND PERMIT <direction> to indicate the direction you want the new room to extend towards. If you want to change an existing connection, first specify the room's current direction, then specify the new direction. For example, to change your room that is currently EAST of your main room to extend NORTH instead, use SHOP EXTEND EAST NORTH. SHOP INFO This command will let you get a general shop listing. SHOP PARTNER lets you give others access to your shop for selling items. SHOP TRANSFER allows you to transfer ownership to one of your partners. You will be removed from the shop entirely, with no further claim to the location or contents. SHOP BAN lets you restrict others from entering your shop. Up to 15 people can be banned from each shop. You can close your Shop to all public by closing the portal when standing outside the shop. You'll be able to let yourself and group members in, even while it is closed. Closing the shop will not stop anyone inside from purchasing items, which makes it possible to hold private sales. SHOP SIGN allows you to place a sign in your shop to describe your wares. Each room can have one column-formatted sign, which can be purchased at the Shop Furniture merchant. Use ]] (two right brackets) to insert a return into the sign text. SHOP SELL will let you sell items in your shop. Hold the item in your right hand and use SHOP SELL <price> to put the item for sale on your display. If you want to remove it from sale, simply PULL the item from the display. SHOP PRICE will let you change the price of an item already for sale in your shop. This is beneficial for those who have had bards sing to their items prior to placing the items for sale; the items can be repriced without having to be resung. The command is SHOP PRICE <item> <price>. SHOP INVENTORY will display a list of items and prices in your current room. SHOP SALES This command will let you see the last 5 items to sell in your shop. It will display the item name, the price, and the amount after tax. SHOP DEPOSIT will allow you or a partner to add silvers to the shop's main (owner's) account. SHOP HAGGLE lets you adjust bias towards any race or profession. Note that race bias takes precedence over profession bias if the race modifier is not 100%. Valid races: human, giantman, halfelf, sylvan, darkelf, elf, dwarf, halfling, forestgnome, burghalgnome, halfkrolvin, erithian, aelotoi. 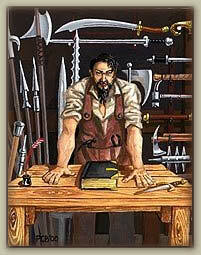 Valid professions: warrior, rogue, wizard, cleric, empath, sorcerer, ranger, bard, paladin. SHOP HAGGLE ALL will show you the list of your bias standings. SHOP ARRANGE lets you select how you want your room to look. SHOP ROOF toggles the visibility of your shop's roof. SHOP DOWNSIZE This command will remove a room in a multi-room (2-3) shop. You must stand IN the room you wish to remove. PLEASE NOTE: This will clear your shop balance and any items left in that room. The items will be placed in your local permit office and you will need to ASK CLERK(NPC) for crate to retrieve any items or shop balance. SHOP LOTTERY This command is a new system created to release player shops. This page was last modified on 7 April 2019, at 06:23.